Anthony Scaramucci, whose extremely short-lived tenure as White House communications director launched a thousand memes, will be taking on a new, temporary role come Monday: TMZ host. As announced on Wednesday morning, Scaramucci will host both the TMZ on TV (which has apparently been on the air since 2007) and the online show TMZ Live. He will host TMZ Live with TMZ founder Harvey Levin. "I&apos;m really grateful to Harvey Levin and the entire TMZ family for this vote of confidence," Scaramucci said in a statement. 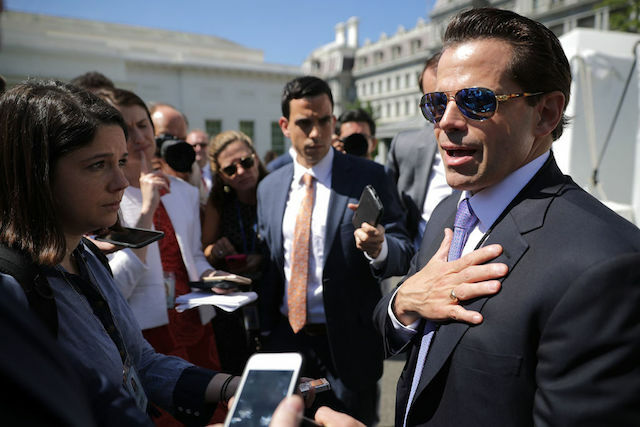 "It will only be 1/11th of a Scaramucci," he added in a tweet, referencing the fact that his short time at 1600 Pennsylvania Avenue has now become a joke unit of measurement. "Anthony Scaramucci will have an even shorter run on TMZ than he did as White House Communications Director, but it is going to be awesome," Levin added in a statement. Yes, we remain truly in awe of this turn of events, rivaled only by Scaramucci&apos;s equally awesome-in-the-true-sense-of-the-word July interview with Ryan Lizza of the New Yorker. TMZ on TV airs at 6 p.m. and 11 p.m. on weekdays on Fox 11. You can check your local listings here. We would also like to take this opportunity to remind everyone that Scaramucci&apos;s Twitter bio just reads "The best is yet to come."